Braintree offers an all-in-one merchant account and gateway solution to process your credit card and PayPal transactions and bring simple and easy-to-understand payment processing right to your door. WooCommerce Braintree brings the great features that Braintree offers directly to your WooCommerce store with one of the most advanced payment gateway integrations for WooCommerce. 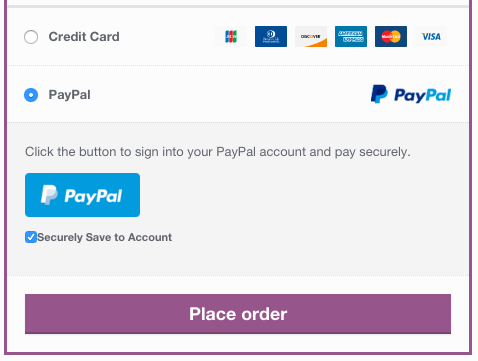 Let your customers save their credit cards and link PayPal accounts to their WooCommerce account for fast and easy checkout. Includes full support for WooCommerce Subscriptions and WooCommerce Pre-Orders. Start using the most advanced payment gateway today! This Braintree Payment Gateway extension uses Braintree’s Hosted Fields feature, which makes it PCI DSS v3.0 SAQ-A compliant while appearing to keep customers on site during your checkout process. Sensitive payment information is posted directly to Braintree via fields that are in an iframe on your checkout page, bypassing your servers and many security requirements. Customers get an easy, seamless checkout, while you benefit from excellent security. Why is WooCommerce Braintree right for you? 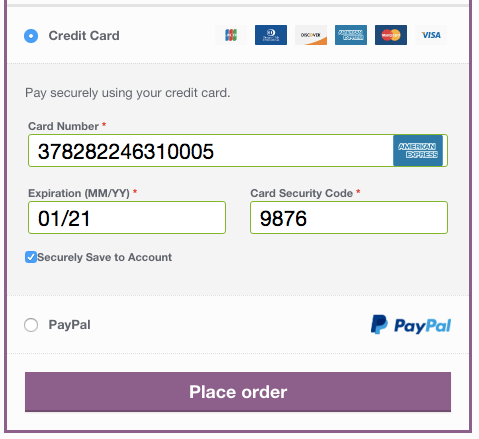 WooCommerce Braintree keeps customers on your site for checkout, while using a secure payment form hosted by Braintree. Checkout is completely integrated into your site. You can also opt to show detailed decline messages to your customers, no more “an error occurred” error messages! 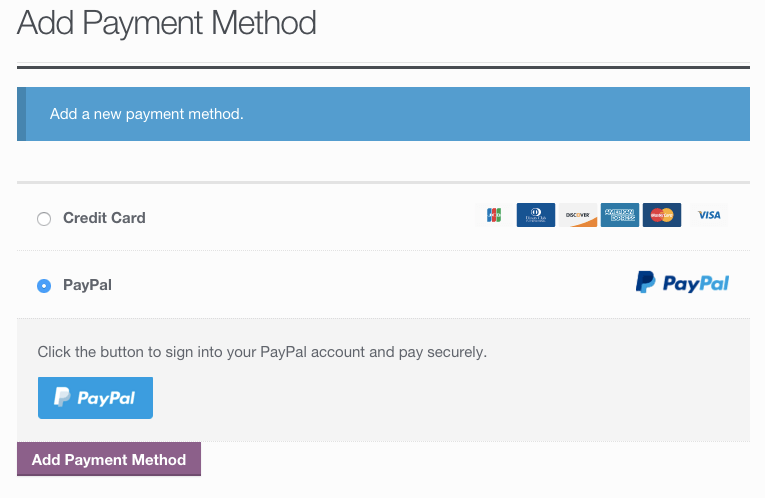 Version 3.0+ adds support for PayPal via Braintree! Your customers can check out with Checkout with PayPalfor one time purchases, or check out via PayPal Vault to link a PayPal account to your store for future purchases. WooCommerce Braintree will intelligently detect which workflow to use based on whether the customer wants to save payment information (or if a subscription is purchased). This gateway integration makes full use of all recommendations from Braintree to maximize security. Credit card number fields are hosted by Braintree and embedded on your site so that sensitive information never touches your server! This means that the integration is PCI DSS v3.0 SAQ-A compliant. You don’t have to redirect customers to another site for checkout and therefore reduce the chance that they’ll abandon the purchase, but can still maintain the highest levels of security. Rest easy knowing that your transactions are under virtual lock and key. Customers can easily & securely save multiple credit cards or link multiple PayPal accounts to their store account for faster checkout; payment data is stored on Braintree’s secure servers. There’s no limit to the amount of credit cards or linked PayPal accounts a customer can store on their account. Customers can also select a default card, remove saved credit cards / unlink PayPal accounts, or add new payment methods from the “My Account” page so that you offer maximum flexibility and take away excuses for customers to say “no” to purchases. 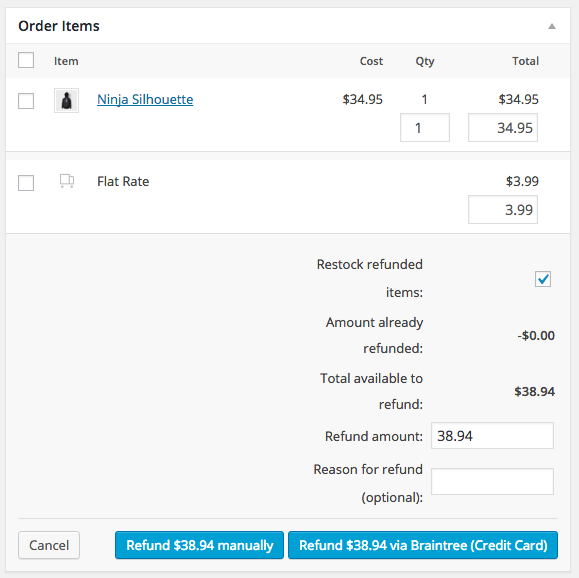 Shop employees can now process refunds for an order paid for with Braintree (credit cards or PayPal) directly from within WooCommerce — no more logging into your merchant account to process refunds! 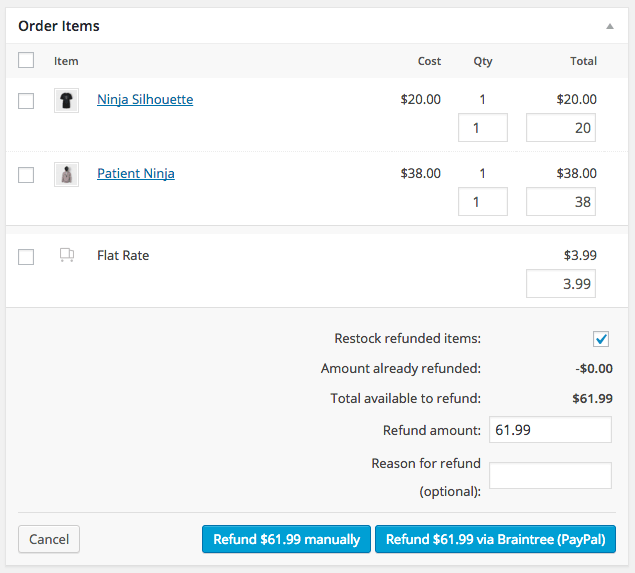 Speed up your store management by creating full or partial refunds from the “Edit Order” screen and sending the transaction automatically to Braintree by clicking “Refund via Credit Card” (or PayPal). Some users choose to set the payment gateway to only authorize charges rather than authorize & capture them. However, this requires the user to then log into the payment gateway admin to capture charges. Version 3.0+ of this extension allow you to optionally capture previously authorized transactions directly from the WooCommerce Edit Order screen rather than logging into your Braintree control panel to do so. 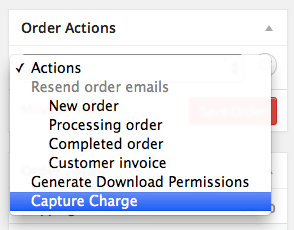 Simply edit the order, select the “Capture Charge” action, and charges will be captured through Braintree (works for credit cards or PayPal). Braintree is the ideal gateway for WooCommerce Subscriptions, offering support for all of Subscriptions features – payment date changes, subscription date changes, and more. With version 3.0+, you can also usePayPal via Braintree for subscriptions sold on your site, as customers can link a PayPal account via the PayPal Vault. This gives you a fantastic (and easy to use!) 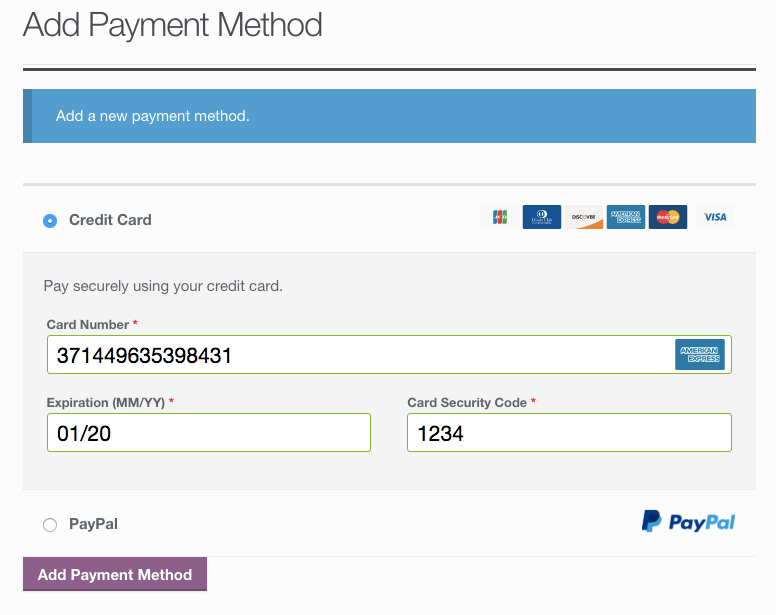 alternative to PayPal Standard. 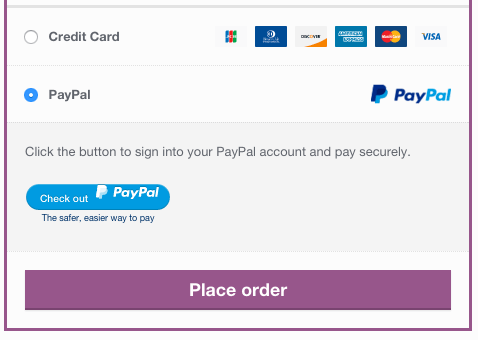 WooCommerce Braintree also fully-supports WooCommerce Pre-Orders, so you can take customer’s payment information upfront and then automatically charge their payment method once the pre-order is released. 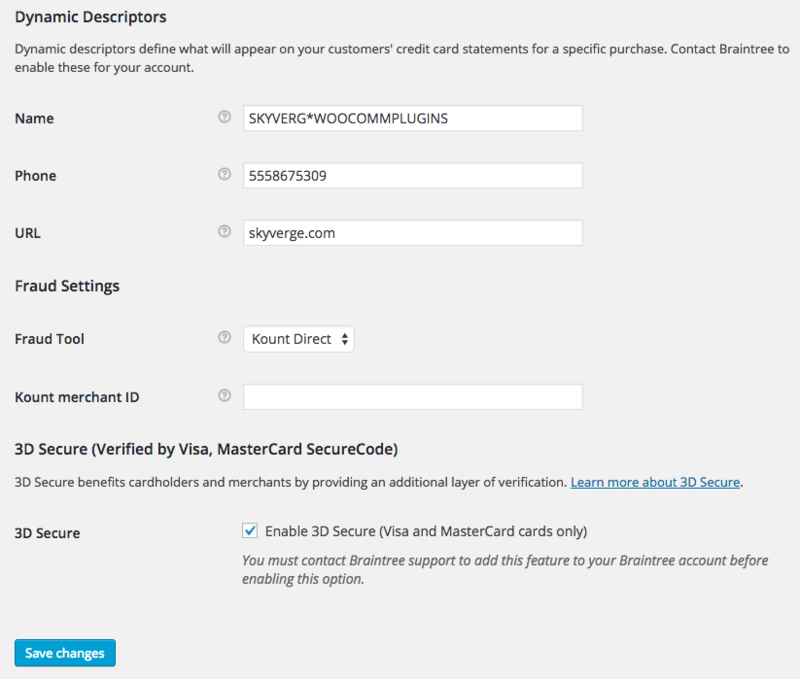 WooCommerce Braintree will now let you save multiple merchant IDs in WooCommerce to support multiple merchant accounts (for different currencies). By itself, this will not display any price changes in different currencies or process payments via your added merchant accounts. You must use a currency switcher plugin to enable multi-currency support in your shop and to tell Braintree which merchant account to run the transaction with — we recommend Aelia Currency Switcher (purchase required) as it’s already compatible with WooCommerce Braintree. WooCommerce Braintree features support for some of the excellent tools Braintree provides to merchants, such as fraud tools, dynamic descriptors, and 3D Secure. If these are enabled in your Braintree account, you can enable them within the WooCommerce plugin.